Mix together all ingredients except Rice Krispies and chocolate chips. Fold in Rice Krispies and chocolate chips. Drop by rounded teaspoon on greased baking sheet. Bake at 350 degrees for 12 minutes. 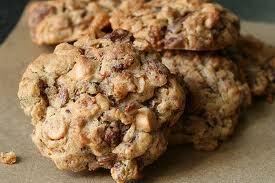 *Can substitute chocolates with one or a mixture of several of these: about 1 to 1 1/2 cups dried cranberries, peanut butter chips, chopped pecan or macadamia nuts, white chocolate chunks, or raisins…whatever you like.